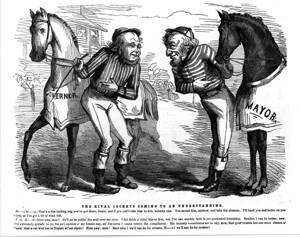 When he was not quite 19 years old, Thomas Nast’s first opportunity to contribute political cartoons on a regular basis came in early September 1859 with the establishment of Phunny Phellow, a comic monthly supported by the hugely successful publisher of popular fiction, Street and Smith. The young caricaturist’s unsigned work as a professional illustrator had been appearing intermittently in the firm’s flagship New York Weekly for several months. He would maintain a working relationship with the two Street and Smith publications until August 1873, when a new contract with Harper’s Weekly obligated him to end the association.